The first two weeks of Trump administration have not been without controversies. Even though any new administration has growing pains and takes the time to settle down, particularly one that is relatively unconventional, the events provide a flavor for things to come. One thing is clear. President Trump wishes to hit on his campaign promises, including some of the controversial ones, right away. This means that the travel ban is just the beginning, and there will be more such controversies in the months ahead. Controversies can unsettle the market, leading to enhanced volatility. That is what we believe investors have to be prepared for in the upcoming months. But controversial policies by themselves do not derail a stock market. In the past we have discussed the three key supports for the market - Earnings, Economy and Monetary Policy - including in the article titled, The Return Of The Fundamentals. The impact of the controversies has to be viewed through the prism incorporating these three market supports in order to arrive at a more informed opinion about the market. When one wears an investor hat, the focus should be on investment returns, and how the policies impact the portfolio. Such a review should take care to not be affected meaningfully by personal opinions on the broader correctness, merit, or prudence of various policies. Policies considered divisive may collectively end up tipping the scales eventually and hurt consumer confidence and investor sentiment. But at this point, we are not there yet. Presently, the stock market has the necessary support to move higher. Staying the course remains an optimal strategy! The reported earnings have been strong thus far with many upside surprises as judged by the S&P 500 reports. 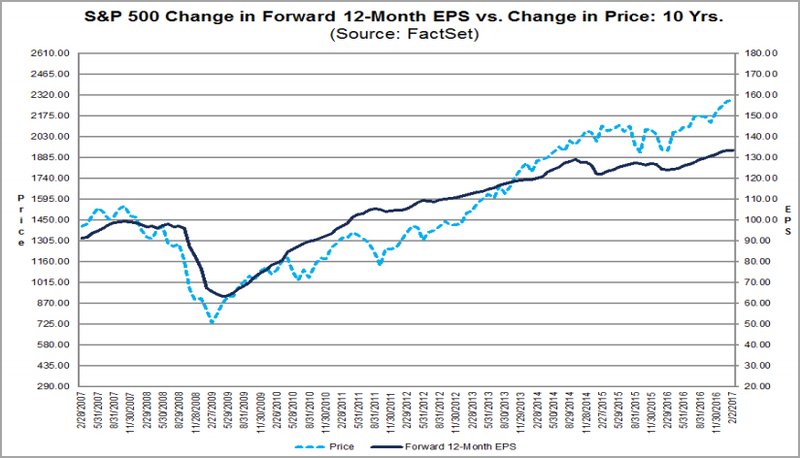 Of the 275 S&P 500 companies reporting as of end of last week, 65% have beaten the mean EPS estimate, as per Factset. With an expectation of +4.6% earnings growth for the fourth quarter in S&P 500 companies, this will mark the first time since the first quarter of 2015, that the S&P 500 will experience two consecutive quarters of earnings growth. The S&P 500 is trading at a forward 12-month Price-Earnings (P/E) ratio of 17x, which is above the 5-year average of 15x, and the 10-year average of 14x, as per Factset. This is an upbeat market, and valuations are shifting higher while expecting the earnings to catch-up. Considering that earnings have momentum, this is not an unreasonable expectation. And often times in this cycle, the market has self-corrected itself by consolidating or pulling back somewhat to maintain a balance without changing the overall uptrend. To take a lesson from the wisdom of John Templeton, looking at the P/E ratios one would surmise that we are in an optimistic state; a step-or-two-up from where long-term averages suggest. But it will be a stretch to suggest that we are in a euphoric state, which can presage a major shift in trend. Consumer and Business Spending account for a major portion of economic activity. In turn, both are impacted by sentiment - Consumer and Business Confidence. At this time, there is no indication that confidence levels are reversing and declining consistently. Confidence levels have risen sharply for both household and business sentiment, and are maintaining such levels. The Consumer Confidence survey results, which shot up in December 2016 to the highest level since 2001, has maintained a similar level in the latest January 2017 reading, easing up just a little from its 15-year high. Such high levels are corroborated by the University of Michigan consumer sentiment index as well. 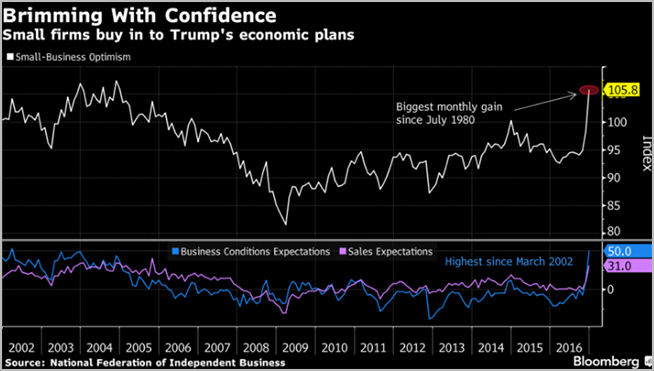 Business confidence has leaped higher, particularly among small businesses which account for the bulk of US employment. The National Federation of Independent Business' index jumped to its highest level since 2004.
Business Spending, which is a major economic driver, is now showing signs of stabilizing and emerging from its negative growth in 2015 and early 2016. While still soft, it is a turnaround with an optimistic tone. Perhaps even more encouraging is that Equipment Spending by businesses finally rose in the final quarter of 2016, the first time in over a year. It has to be noted that confidence measures can be volatile and turn fairly quickly. The market optimism for the new administration's potential policies has yet to turn to reality. Tax cuts and infrastructure spending amongst other pro-growth measures have yet to take shape in Congress. A big risk that exists for investments in the present political environment is for a number of controversial policies and management style - trade wars, travel restrictions, tweeting on companies and dissent, etc. - to eventually coalesce to a critical mass over time and substantially undermine business and consumer confidence. The new administration, a collection including many business-savvy entrepreneurs, has to be well-aware that stability in policy is good for business. Policy making that is whimsical or delivers unexpected surprises erodes business and consumer confidence. A country divided comes to a standstill. But we are not there yet, and may not even get to that dire state. At this time the economy is not under a threat of a recession, and bear markets typically occur when the market senses a looming recession. As discussed in our Market Outlook 2017, we foresee meaningful gains in the first-half of the year. 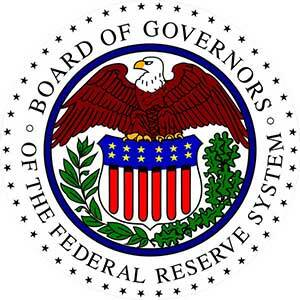 The final pillar of stock market valuations is the monetary policy by the Federal Reserve ((FED)). Higher rates by themselves do not trigger a stock market correction or a bear market. It is the prospect of overtightening resulting in stifling economic growth and eventually leading to a recession, that worries financial markets. Following the Federal Open Market Committee (FOMC) meeting last week, the statement released suggested that the august body believes the rising confidence should bolster economic growth in the year ahead. But the monetary policy will be more evidence-based - which means the committee needs to see economic growth being delivered before further action. Notably, the decision was unanimous. This is a prudent stance on the part of FED, for just like investors, even the FOMC has not much to lean on when it comes to the impact of a mixed bag of unconventional and also unknown policies on economic growth. Furthermore, the recently released Nonfarm Payroll report alleviated urgency to raise rates to get ahead of inflation, as it revealed average hourly wage growth of 2.5 percent over the same time last year, the weakest growth since August 2016. In a speech last month titled The Goals of Monetary Policy and How We Pursue Them, the FED Chair Janet Yellen offered a plan to raise interest rates to a long-term neutral rate of 3% by the end of 2019. But obviously, as 2016 has shown, the FED is data-driven and open to do what is better for the broader economy based on evolving economic conditions. The monetary policy firmly remains supportive of the stock market. Investors have to plan for volatility. But the support structure for the market to move higher remains intact, and the overarching trend continues to be favorable at present. The risk-taking investor sentiment, that propelled the small cap Russell 2000 index (IWM) to a +20% gain and the Graycell Small Cap to a +71% gain in 2016, still remains in place. In fact, this year another speculative sector has set off on a strong start - Biotechnology - suggesting that risk appetite remains strong. The sector, as represented by the Nasdaq Biotechnology Index ETF (IBB), was up +5% in January, and the Prudent Biotech portfolio was up +14%. We discussed the biotech sector prospects in greater detail in the Biotech Bonanza article. The key stock indexes, S&P 500 (SPY) and Nasdaq (QQQ) were up 12% and 8%, respectively, during 2016. 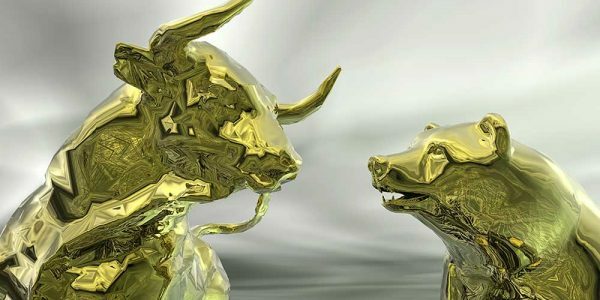 Based on the fundamental support and risk tolerance, we believe the stock indexes will continue to record new highs for the near future and investors should continue to take advantage of this window of opportunity, which will not be eternal. We still feel it is important to build a portfolio of stocks covering different sectors and market segments - small and mid caps. Staying the course, and modeling a growth portfolio to take advantage of strong periods of return has worked well for us over the years, driving consistently strong performance. Over the past months, we have suggested some promising names. Few of them have been acquired, like Ariad Pharmaceuticals (ARIA), Collucid Pharmaceuticals (CLCD), and Clayton Energy (CWEI). Others attractive small caps and mid caps include Clovis Oncology (CLVS), Resolute Energy (REN), Array Biopharma Inc (ARRY), Kemet (KEM), Achaogen (AKAO), Mechel Oao (MTL), Fairmount Santrol (FMSA), Kronos Worldwide (KRO), Allegheny Technologies (ATI), Emerge Energy Services (EMES), NRG Energy (NRG), Synergy Pharmaceuticals (SGYP), Tesaro Pharmaceuticals (TSRO), Acadia Pharmaceuticals (ACAD), and large-cap Incyte Pharmaceuticals (INCY), to name a few. Small-cap exposure can also be acquired through ETFs like iShares Small Cap (IJR), iShares Russell 2000 Growth (IWO), and iShares Russell 2000 Value (IWN), while Biotech ETFs include Spdr Healthcare (XLV), leveraged Direxion S&P Bull (LABU) and Direxion S&P Bear (LABD). As always kindly do your own due diligence. Please feel free to add to this discussion or point out errors, in the Comments section.